Philippine authorities were evacuating thousands of people from the path of the most powerful typhoon this year, closing schools, readying bulldozers for landslides and placing rescuers and troops on full alert in the country’s north. More than 4 million people live in areas at most risk from the storm, which the Joint Typhoon Warning Center in Hawaii categorized as a super typhoon with powerful winds and gusts equivalent to a category 5 Atlantic hurricane. Typhoon Mangkhut is on course to hit northeastern Cagayan province early Saturday. 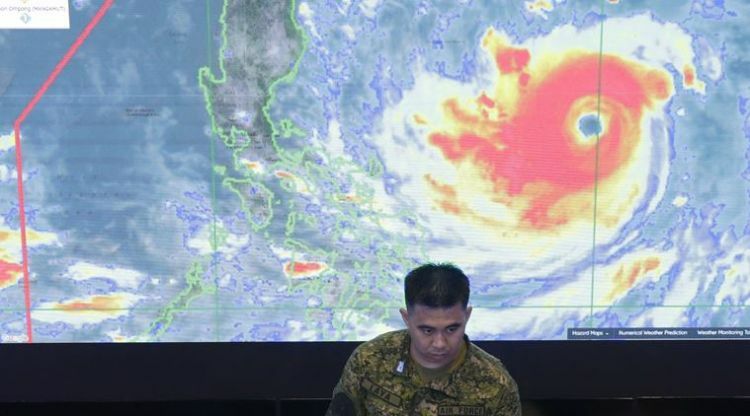 It was tracked on Friday about 400 kilometers away in the Pacific with sustained winds of 205 kilometers per hour and gusts of up to 255 kph, Philippine forecasters said. With a massive raincloud band 900 kilometers wide, combined with seasonal monsoon rains, the typhoon could bring heavy to intense rains that could set off landslides and flash floods, the forecasters said. Storm warnings have been raised in 25 provinces across the main northern island of Luzon, restricting sea and air travel. Office of Civil Defense chief Ricardo Jalad told an emergency meeting led by President Rodrigo Duterte that about 4.2 million people in Cagayan, nearby Isabela province and outlying regions are vulnerable to the most destructive effects near the typhoon’s 125-kilometer-wide eye. Nearly 48,000 houses in those high-risk areas are made of light materials and vulnerable to Mangkhut’s ferocious winds. Across the north on Thursday, residents covered glass windows with wooden boards, strengthened houses with rope and braces and moved fishing boats to safety. Cagayan Gov. Manuel Mamba said by telephone that evacuations of residents from risky coastal villages and island municipalities north of the rice-and corn-producing province of 1.2 million people have started and school classes at all levels have been cancelled. A change in the typhoon’s track prompted authorities to rapidly reassess where to redeploy emergency teams and supplies, Mamba said. Duterte asked Cabinet officials from the north to help oversee disaster-response work if needed, and told reporters it was too early to consider seeking foreign aid. The typhoon is approaching at the start of the rice and corn harvesting season in Cagayan, a major agricultural producer, and farmers were scrambling to save what they could of their crops, Mamba said. The threat to agriculture comes as the Philippines tries to cope with rice shortages. Officials said other northern provinces started evacuating residents Thursday from high-risk areas, including in northern mountain provinces prone to landslides. Duterte canceled his appearance at a missile test firing aboard a navy ship off northern Bataan province due to the approaching typhoon. On Guam, where Mangkhut already passed, residents dealt with flooded streets, downed trees and widespread power outages. Government agencies were conducting damage assessments and clearing roads, according to the Pacific Daily News. About 80 percent of the US territory was without power but it was restored by Thursday morning. Mangkhut, a Thai word for the mangosteen fruit, is the 15th storm this year to batter the Philippines, which is hit by about 20 a year and is considered one of the world’s most disaster-prone countries. Typhoon Haiyan left more than 7,300 people dead or missing and displaced over 5 million in the central Philippines in 2013.